Hearty and deliciously flavourful! 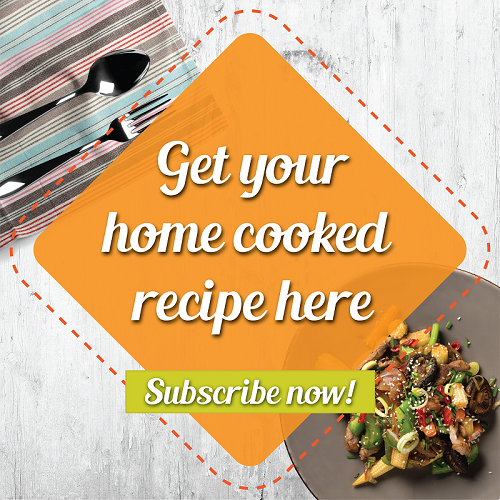 Packed with all the good stuff from tender juicy chicken, saffron, chorizo sausages and more! 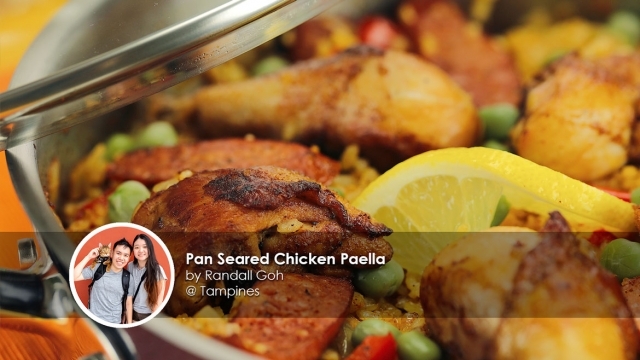 This no-fail, weeknight dinner Pan Seared Chicken Paella recipe is shared by home cook Randall Goh. 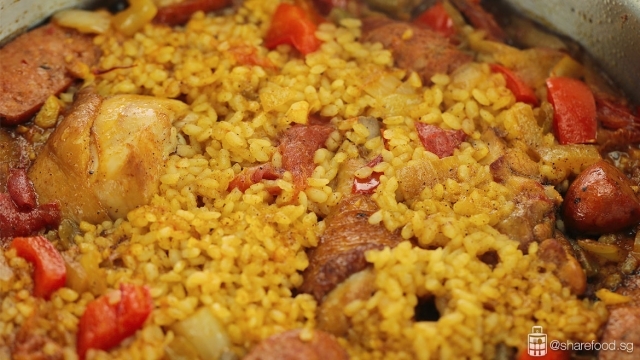 Deliciously fragrant rice cooked with all the good stuff - chicken, saffron, chorizo sausage and more! For an even easier cooking process, use Meyer OPT Steel 24cm saute pan. 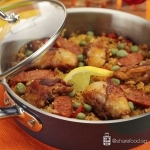 The stainless still pan holds heat well and is great for cooking dishes with longer cooking time such as Paella. The textured surface of the pan is great for browning and searing. You can use over induction stove and is oven safe up to 230 degrees Celsius. Simmer chicken stock with saffron. Simply pour chicken stock into a saute pan and bring it to a simmer. Add saffron and a pinch of salt. 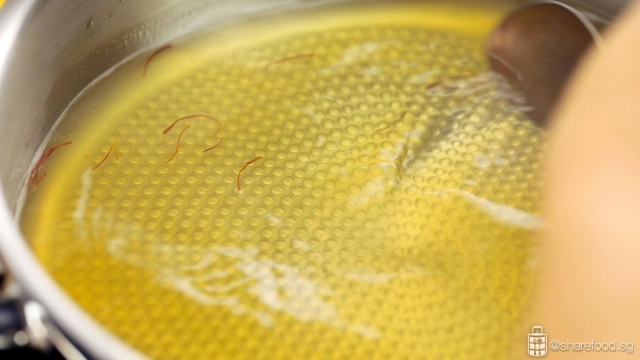 Reduce heat and transfer it to a bowl. Next, in a mixing bowl add in chicken and marinade. Mix evenly and set aside. 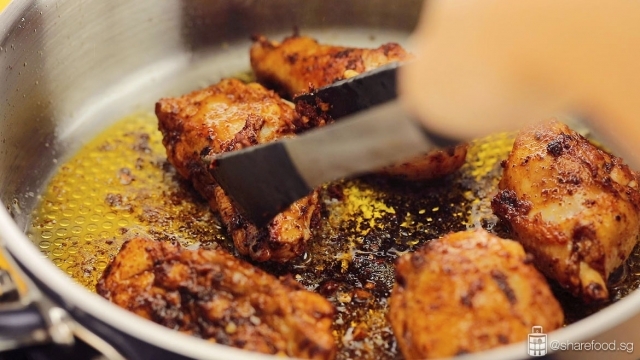 Watch closely while searing the chicken to prevent it from getting burnt. Heat olive oil in the OPT Steel saute pan over medium-high heat. Add in chicken and sear for 2 minutes. Turn the chicken to the sides for 3 minutes till evenly brown. Add in green beans, red peppers, onion and chorizo sausages and saute for 5 minutes. Next, add in the tomatoes and garlic and saute for another 5 minutes. Pour in the chicken stock and mix evenly. Bring it to a boil and add in the Japanese short grain rice. Lower the heat and simmer for 20 - 30 minutes. 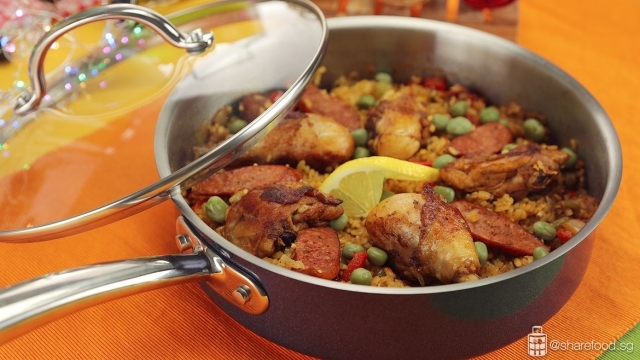 Simmer for 20-30 minutes and you'll get delicious fragrant Paella! Remove the pan from the stove and garnish with sweet peas! Squeeze lemon juice over the paella and serve. We call this the ideal go-to meal without the laborious work required in the traditional Spanish version! Using a stainless steel pan, pour in chicken stock and bring it to simmer. Add in saffron and a pinch of salt. Turn off the heat, transfer to a bowl and leave the saffron to infuse into the chicken stock. Mix chicken and marinade evenly in a mixing bowl. Set aside. Place the Meyer OPT Steel 24cm saute pan on stove. Heat up the pan on medium high heat. Add olive oil till you see light smoke. Add chicken and sear it for 2 mins. Turn to the sides and brown the chicken evenly for 3 mins. #Tips: Watch closely to prevent the chicken from getting burnt. Add in green beans, red peppers, onion and chorizo sausages, saute for 5 mins. Add in tomatoes and garlic, saute for another 5 mins. Pour in the chicken stock and mix evenly. Bring it to a boil and add in the rice. Mix evenly. 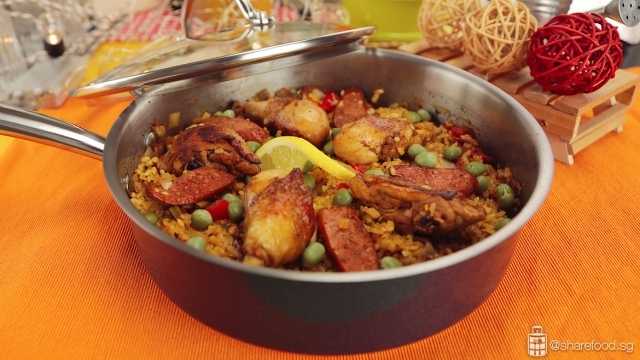 #Tips: Do not stir the paella again. Lower the heat allow it to simmer for 20 – 30 mins. It’s ready when the rice have absorb all the chicken stock. Turn off the heat, cover with the lid or a towel for at least 10 mins. #Tips: The rice will continue to absorb the stock and it will continue to cook gently till the grains are fully cooked. Remove from stove and garnish with sweet peas. Squeeze lemon juice on the paella and serve immediately.